“Thank you for the experience. I finally got an idea of how things are in the real world.” — Comment from a student after participating in Crazy Cash City. On December 10, 2013, First Nations Development Institute (First Nations) partnered with First Financial Credit Union to provide the “Crazy Cash City” money-spending simulation for students at Gallup Central High School in Gallup, New Mexico. The program was offered to the entire school, and 85 students participated. 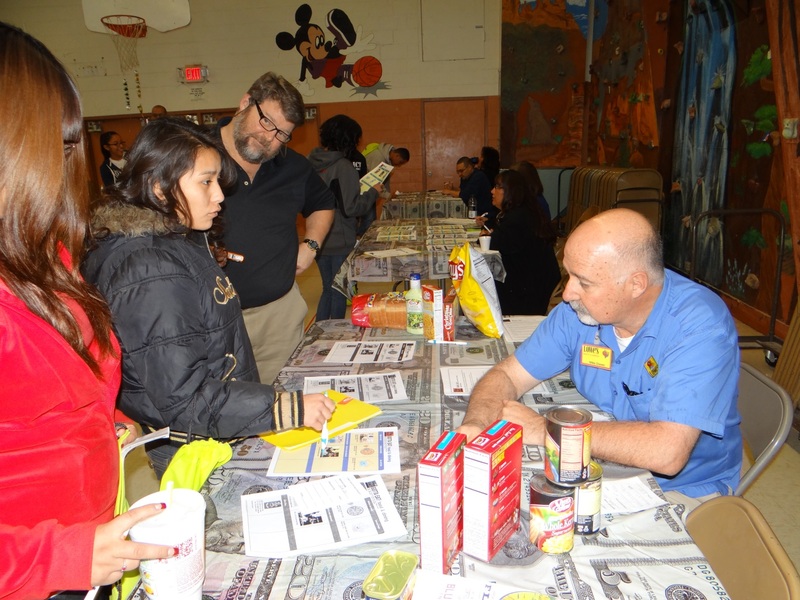 The Crazy Cash City event was held in the school’s gym and consisted of two 90-minute reality fairs in which the students had to navigate a series of simulated financial tasks designed to teach basic budgeting and banking skills. It was all in fun — since they were spending play money and not really buying things — but it was also informative and highly interactive. All participants were given a folder containing a fictitious family profile that listed what their income was, the income of a spouse, the age of any children, and any outstanding debt or benefits they received. 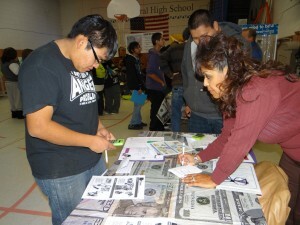 The high school kids then visited about 10 booths that provided various choices for housing, transportation, child care and more, and were asked to make smart financial decisions based on their family profile. At the conclusion of the seminar, the students were expected to have a fully balanced budget that they logged in their check register and budgeting sheet. Jason Valentine of Coldwell Realty (right) pitches a "hard sell"
The event was made possible by a partnership between First Nations, faculty and leadership at Gallup Central High School, and First Financial Credit Union. 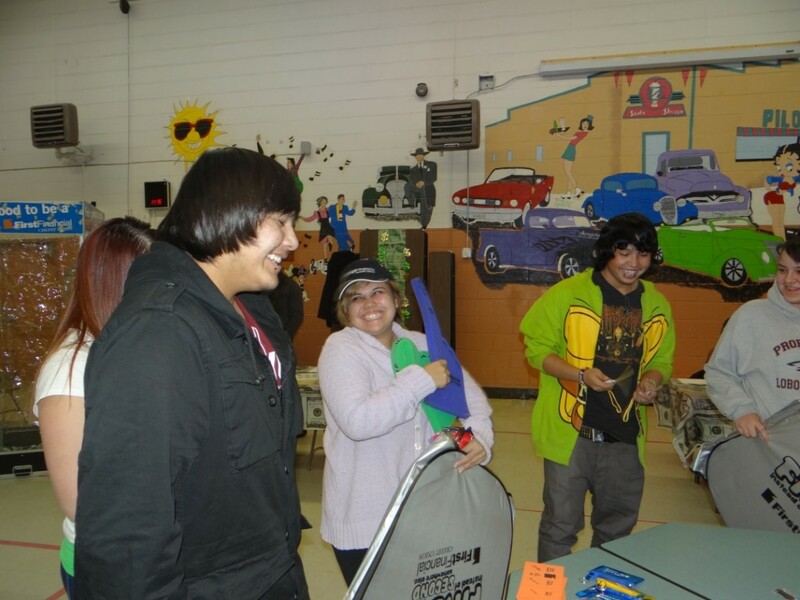 Other community partners chipped in including volunteers from the Office of the Special Trustee for American Indians, Navajo Partnership for Housing and local retailers. 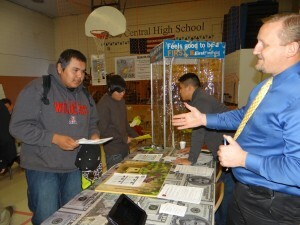 Gallup Central High School Teacher Arnold Blum, First Financial Business Relations Manager Dale Detrick, and First Nations Financial Consultant Shawn Spruce coordinated the event. 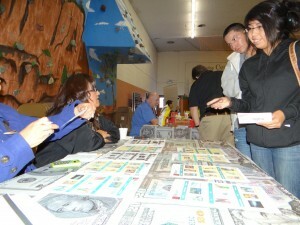 The event was partially funded by a grant from the National Credit Union Foundation and resources from the W.K. Kellogg Foundation. Students who filled out an evaluation form for the event expressed their support for the workshop and stated that the Crazy Cash City money simulation was a valuable experience. Most importantly, all agreed that the simulation helped them learn to manage their money and that they could now successfully make and use a monthly budget. Some students had such an enjoyable time during the first simulation that they participated again in the second event. Many of the students who repeated adjusted their approach from the lessons they learned during the first go-around and even served as mentors to first-timers when they needed help.